Here's a little something that I sometimes find myself getting tripped up by. Since Inventor R2008 can open a dwg without importing it, how do I tell Inventor when to import, and when to open? It's actually pretty straight forward. When you choose your AutoCAD dwg to open, there will be an 'Options' dialog box at the bottom of your screen. Most of the time, these are the options file I ignore, knowing full well I do so at my own peril. I guess you can say that for a computer geek, I live on the edge. (I've been known to go crazy and cut the tags of my mattresses too). 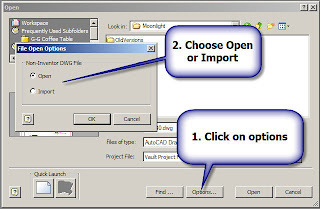 In any case, click on that options button, and you'll be able to choose between opening the dwg, and importing the dwg.